Featuring 40 cards. Click here for a full breakdown of the Prospect Autographs. Featuring players from past High School All-American Games. Click here for our comprehensive guide. 2012 Bowman Draft Picks and Prospects Baseball gives collectors the first chance to get cards of 2012 draft picks in their MLB uniforms. Offering both regular Bowman and Bowman Chrome cards, hobby boxes promise one Bowman Chrome autograph. 2012 Bowman Draft jumbo boxes have three Bowman Chrome autographs. Seven-card packs break down to include two Bowman Chrome cards and five regular Bowman cards. Although the draft pick cards are technically inserts and not true rookie cards, many will likely become the players' most sought after cards. 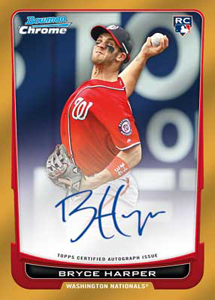 What are the hottest cards in 2012 Bowman Draft? Find out with our real-time card tracker. The 2012 Bowman Draft Picks and Prospects base set has just 55 cards. All are 2012 rookie players. However, the main draw are the Draft Pick cards. The checklist has 165 players, including many from the 2012 MLB Draft. 2012 Bowman Draft has several parallels. Basic 2012 Bowman Draft versions include Silver Ice, Blue (#/500), Orange (#/250), Red Ice (#/25), Purple Ice (#/10), Bowman Red (1/1) and Printing Plates. 2012 Bowman Chrome Draft rainbows include Refractors (1:4), Blue Refractors (#/150), Gold Refractors (#/50), Orange Refractors (#/25), Purple Refractors (#/10), Red Refractors (#/5), Printing Plates (1/1) and Superfractors (1/1). 2012 Bowman Chrome Draft Autographs all have on-card signatures from more than three dozen draft picks. They too have many parallels: Refractors, Blue Refractors (#/250), Gold Refractors (#/50), Orange Refractors (#/25), Red Refractors (#/5), Printing Plates and Superfractors (1/1). The Bowman Black Autographs set continues. Twenty-five more players have been added to the checklist, each numbered to 25. The striking cards use silver signatures on black backgrounds. 2012 Bowman Draft also has randomly inserted AFLAC, Perfect Game All-American Classic and Under Armor All-American Autographs featuring former high school players. All are numbered to differentiate them from similar cards that were handed out at the games themselves. These are also extra autographs inserted in addition to the promised Bowman Chrome Autographs. New to 2012 Bowman Draft are Dual Top 10 Picks Autographs. The cards pair up a signature from a recent top pick with one from the past. The 2012 XM All-Star Futures Game is well represented in 2012 Bowman Draft with several relic card offerings. These include 2012 XM All-Star Futures Game Jersey Relics (#/199), Jumbo Patch (#/25), Patch Book Cards (1/1) and Logo Patch Cards (1/1), which have a silhouetted MLB logo. Bowman's Best returns with a new design. Inserted 1:6 packs, the checklist has a total of 50 different rookies and prospects. Parallels include Die-Cut Refractors (#/99), Die-Cut X-Fractors (#/25) and Die-Cut Atomic Refractors (1/1). Inserted 1:6 packs, Bowman Prospect Challenge code cards let collectors compete for monthly autograph prizes. A grand prize winner receives an exclusive 150-card autograph set. 2012 Bowman Draft Picks and Prospects Baseball is a hobby-only release. Good: Unlike 2012 Bowman Chrome, the Prospect Autograph checklist for this product is stacked. The chance of pulling an AFLAC, Perfect Game and/or Under Armour Game autograph is a plus. Bad: The Bowman formula of one autograph per hobby box means one bad signature can ruin an entire box. Also, with minimal design changes from year to year, things are feeling very repetitive. The Bottom Line: With a great chance of pulling an autograph from a 2012 first rounder, intriguing inserts, a plethora of refractors and a Prospect Challenge Contest, it’s an exciting product. 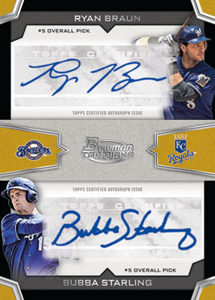 Every year Topps tweaks the look of its Bowman line -- a little bit. Things from the last few years are starting to blur together. I had to pull out my last two years of cards to identify the differences (facsimile autos are absent on cards this year, which also meant removal of the white bar at the bottom of each player’s image that appeared on the 2011 cards, are the most notable changes). So, there really aren’t any new design elements on the base product. The fact that, as always, the prospect autographs are all on-card is a big plus for this product. The inclusion of serial-numbered AFLAC Perfect Game (new for 2012) and Under Armour autos (new for 2012) is nice. These cards will represent some of the earliest autographs from some high school standouts, including Carlos Correa and Byron Buxton, who do not have prospect autographs in this product. It appears that the number of Refractor hits are higher per box than last year. What I always dislike about this product is the inclusion of non-Chrome cards. Does anyone collect these when there are Chrome equivalents of each card? I think Topps could save itself some time and money if it would eliminate the base Bowman line and stick with Chrome. The biggest design change for the product (not the card, the product) is the inclusion of Prospect Challenge cards. These cards will be included in other Bowman products in the coming months. They add additional (potential) value and fun. Like with most prospect-oriented products, the test of the checklist is the future. Topps has stacked the deck this time by including 35 first rounders in the prospect autograph list. Given there are only 40 total prospects on the checklist, this is a good indication that if there are future stars from the 2012 MLB Draft, this product will capture the value. Topps also included some extra potential hits with its always popular AFLAC inserts, including autographs of Carlos Correa and Byron Buxton. Now, the checklist names don't have the draw of previous draft classes as there is nobody hyped like Harper or Strasburg), but still, this is a very representative product. Although there is great potential in the autographs, the guarantee of only one signature hit per box (the same-old repetitive Bowman formula) really affects value. Sure, there’s a chance of a box having multiple autographs, including a more limited AFLAC, Under Armour or Perfect Game auto, but there will still be quite a few dud boxes out there. Disclaimer – I am the king of dud boxes, as statistically most of you should be also. So when there’s only one hit per box, a bad autograph can really hurt the value of the box. Now, the odds are, this would be a good box to buy -- and hold. If stars arise from the 2012 draft class, they'll likely be in this product. So, as time passes, the value of unopened boxes could easily increase. All that being said, when there is only one autograph per box, it does build the excitement factor. And sure, just because you don’t know who the prospect is that you pulled, given it is likely a first rounder, this box may become more fun as time passes. Besides, I'm a slave (for some reason) to Bowman products, so regardless of which prospect I pull, it's always a fun box for me. It's funny, Topps isn't doing much to change this product, but I'm not doing much (by consistently buying it) to force them to change it. Like the often-used saying goes, "If it ain't broke, don't fix it." This is the best product year after year!!!! in my book bdp is #1 every year hands down !!!!!!!! Can’t wait for this products. Will be even better this year with better rookie selection and of course of the draft picks. I bought my first case ever because of this product. Anyone have the checklist yet. Dave Karpinski (ID 89029) � It likely won’t be out until just before the set releases. We’ll have it posted as soon as it’s available. I get a hobby box every year….and I can’t say that for any other product. Always enjoy the product. I’m always pleased with the content of this product. It seems to be consistently on par with, if not better than the Bowman set that came out earlier in the year. This year, though, from looking at the autograph checklist, it looks like Topps decided to hold back a bunch of key prospect autographs for 2013 Bowman. I will buy at least 1 box of the 2012 Draft, but from what I’ve seen, 2013 Bowman will have a deeper checklist. One more thing. I can’t figure out for the life of me why anyone would buy a Jumbo box. It costs way too much. Not worth the price. Next year’s should be better. More autographs needed. Good: Best product on market for prospect and rookie collectors. Every card is either a rookie or prospect card, including players from the 2012 MLB Draft. Decent price. Nice Photoshop of drafted players onto their respective MLB team uniforms. Parallels are plentiful. Bad: Not ideal product for collectors who don’t like little-known rookies and prospects. Most cards on the checklist will be of players many have never heard of before. Only one hit per box. The Bottom Line: 2012 Bowman Draft Picks & Prospects is a great release for prospect collectors, but it doesn’t give you the excitement of pulling current superstars. If you’re someone who’s willing to take the wait-and-see approach, then this is a solid product. That prospect autograph you pulled of some guy you’ve never heard of could end up being a top prospect within a couple of years. But for collectors who are looking for big hits and immediate returns, this product is severely lacking. With the reasonable box price, it might be worth taking a shot. The design falls in line with previous Bowman and Bowman Draft releases of the past. It’s nice to be able to pull two separate ‘sets’ in every pack, since you get both Bowman and Bowman Chrome cards. On the Chrome side, the colored parallels are very nice. For player collectors, this set has a very nice rainbow to chase after. The Ice parallels, which fall one per box, are also sharp. 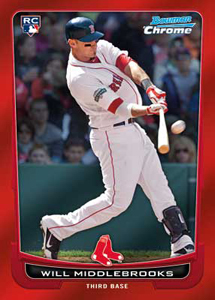 One downside to the release is that the design is exactly the same as regular Bowman that was released back in May. It would’ve been nice if they changed it up at least a little. The autographs are on-card, which is always a nice thing, however it could use more space for the signature. The checklist is decent. Some of the year’s bigger prospects (Bundy, Hultzen, Cole, Lindor) are not in this release since they were already in previous sets. That hurts the checklist a little. The standard rookie card checklist is solid with guys like Bryce Harper, Yoenis Cespedes, Yu Darvish, Matt Moore and Trevor Bauer. Overall, the checklist has a solid amount of young players with lots of potential. Even without some of the previously bigger named recent picks, it still packs a good punch. Because of its lack of current MLB stars, the value is tough to see in 2012 Bowman Draft Picks & Prospects. Most of the stuff you pull is going to command patience. That can be a good thing or a bad thing. Also, with only one hit per box, you better hope you pull a bigger named prospect or else you could be out quite a bit of money. Most collectors, myself included, prefer the instant satisfaction of knowing what kind of value you hit in your box as soon as you open. 2012 Bowman Drafts has very distinct positives and negatives. On the positive side, you’re pulling nothing but rookies and prospects. Who doesn’t love that? On the negative side, you can’t find current superstars like Albert Pujols or Miguel Cabrera. When you’re opening a product that doesn’t have current stars, the fun factor takes a hit. This is the perfect example of a product that Topps suits to a very specific market. And to that end, it’s a great release. This Release has a great crisp clean design.The autographs are sharp and clean. The only negative is there are a few chrome cards with occasional scratches right out of the pack.Which can be very sad if on a nice autographed refractor.Otherwise the memorbilia cards are very sharp with a nice size swatch.For ant prospector or rookie card collector this product will be a hit no matter what.This is a set I collect every year no matter what!